The Virgin of San Juan de Lagos’ pilgrimage is the largest in the western hemisphere. Some three million or more pilgrims from across Mexico will walk for many days, sleeping in the open, to converge on the small town of San Juan de los Lagos, in the state of Jalisco by Guadalajara. Their goal is a small shrine to the Virgin Mary. Nearly 20,000 of those pilgrims will walk from San Miguel and environs, reaching the village after nine days. They create a moving city of all ages, carrying banners, singing songs, chanting, and praying. The crowd gathers near the San Miguel de Allende railroad station on this morning to set out on their trek, and observers are welcome to come and see them off. Foreigners are also welcome to join the pilgrimage, and several do each year. Just remember to travel light. Traditionally on the first night of the walk from San Miguel on the 24th, it rains. According to tradition, in 1623 in the town of San Juan de los Lagos a travelling circus performer fell off a high-wire and suffered mortal wounds. 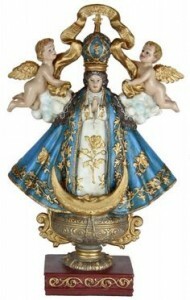 The little girl was rushed to the local church where the villagers prayed to “Nuestra Senora de Juan de los Lagos” represented by a statue of the Immaculate Conception in local dress. The statue was laid on her and she miraculously recovered her life. Since then, devotion to our Our Lady of San Juan de los Lagos has spread to become the second most honored image of Mary in Mexico (first is Our Lady of Guadalupe). Her image is seen throughout San Miguel. Originally Fr. Hidalgo, Ignatio Allende and the other founding fathers in San Miguel for Mexico’s Independence from Spain planned on starting the Revolution during the Virgin of San Juan de los Lagos’ celebrations. Once the Spanish discovered the plans the start was moved up to September 15th with the Virgin of Guadalupe becoming the symbol of Mexico’s freedom.